Having recently emerged from the depths of study for my WSET Diploma spirits exam I find myself tasting wines from South Africa, and like Tersina Shieh in her recent article on Swartland producers, I am very definitely on board with the revolution! First up was a tasting of Morgenster Estate red wines courtesy of Continental Wines and Morgenster Estate’s Export Sales Manager, Huibré Hoff. These wines are made in the style of a Bordeaux blend, that is, they will contain Cabernet Sauvignon and Merlot in varying quantities with the possibility of Cabernet Franc and/or Petite Verdot also being added to the blend. Morgenster Estate, meaning morning star in Dutch, is located in the Stellenbosch wine region of South Africa. 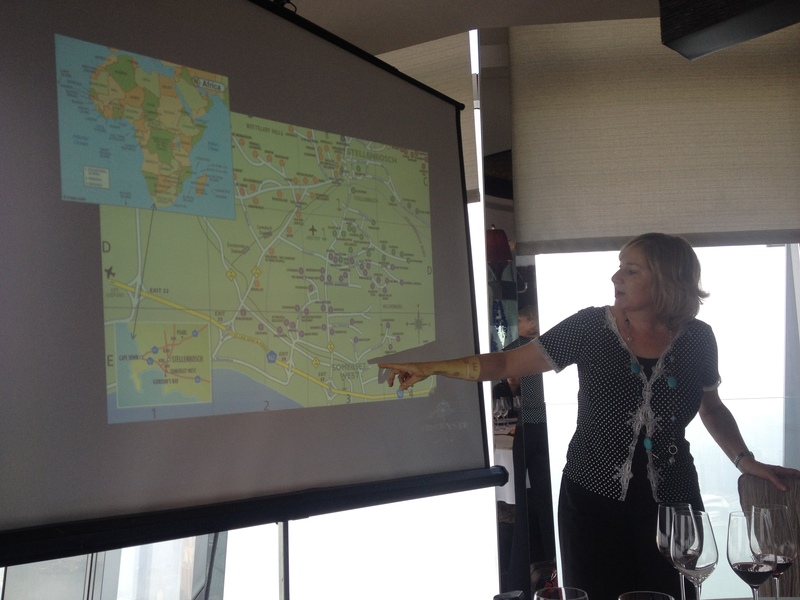 More specifically, the winery is in Somerset West, a region I have written about previously in my article on Journey’s End wines. Owner, Giulio Bertand has assembled an impressive line up with winemaker Henry Kotzé working in close consultation with Pierre Lurton of Cheval Blanc and Chateau d’Yquem. Located 4 km from the sea, Morgenster Estate enjoys cooling breezes from False Bay, which helps to temper the heat during the ripening process. A highlight of the tasting was having a number of different vintages to see how the climate of each year was expressed in the wine. 2005 was a warm vintage and the Merlot led Morgenster 2005 showed ripe black plum and black cherry flavours alongside rich dark chocolate and graphite. In contrast, the Morgenster 2003 from a cooler vintage with Cabernet Sauvignon leading the blend, was finer in structure, darker and a little more tightly wound. Cassis, chocolate and blackcurrant were nicely integrated with subtle notes of oak and structured in a way as to suggest there are many more years of enjoyable drinking to come. 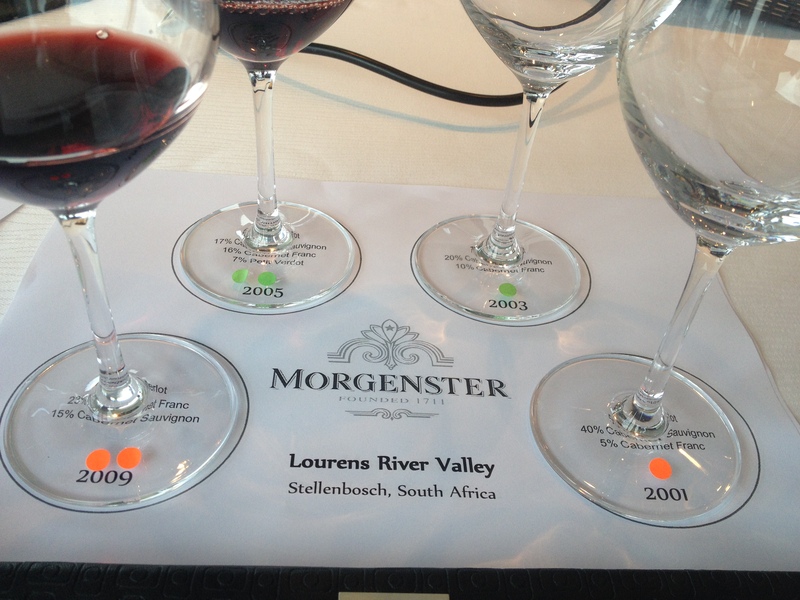 The eldest of the wines on tasting was the Morgenster 2001, a wine from another cool vintage. The skill in marrying the flavours, tannins and acidity to present a fine textured well-balanced wine was evident here too. Lots of black and red plums, cherries and graphite all with ripe, fine tannins adding to the structure and confirming that even at 13 years, this wine still has some years to offer. Staying in Stellenbosch, the next wine that I seem to have told everyone about since I tasted it is the Beyerskloof Pinotage Reserve 2011, shown at a tasting yesterday with Wine N Things. Why am I so excited about this wine? Pinotage is one of those grapes that I just can’t get on board with. I find the aromas of smoke and rubber unappealing and the “organic” country farm smell is often too overwhelming. Given Pinotage is a cross between one of my favourite grapes, Pinot Noir, and Cinsault I can’t quite fathom why it doesn’t work for me. Beyerskloof Pinotage Reserve 2011 has certainly laid down the gauntlet. There are still those smoke notes but they are managed elegantly without a trace of rubber and with its dark brambly berries, its cherries, its smoky tea leaves and the tiniest hint of smoky vanilla I have been won over. There is a nod to the sour cherry notes of its Pinot Noir parent but the lovely smoky tea notes are the winner for me – this wine is delicious and at $186 HKD I know I will be enjoying a bottle or two in the near future! 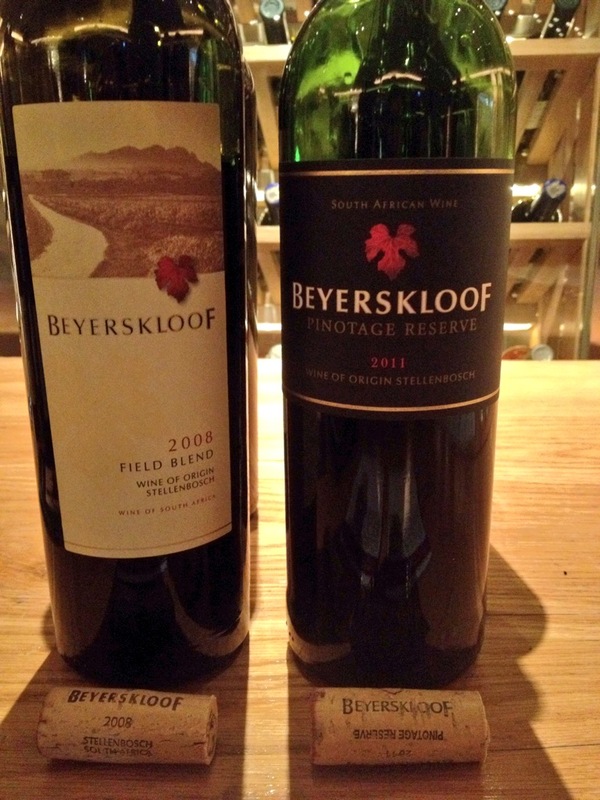 The other wine I tasted from Beyerskloof was their Field Blend 2008, a blend of 63% Cabernet Sauvignon and 37% Merlot. This wine had lots to offer with red plums, black cherries, blackcurrants and dark chocolate which led through to spices such as cloves, vanilla and pepper all with ripe textured tannins. Another wine priced extremely well and most certainly another I would recommend adding to your drinking stash.